The thought of having food already prepped and ready for the week sounds great, doesn’t it? 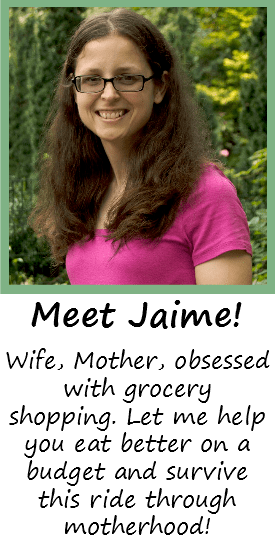 You save time and money knowing that you won’t have to go out to eat because you have a plan. But what if you don’t have time to meal prep? You have kids! Kids are a huge time-sucker, and it can be hard to find time for sitting down, let alone meal prep. Typically, I like breakfasts that bake in the oven. It leaves me time to do my other prep while these cook! I don’t usually chop broccoli or cauliflower on Sunday if I’m using them as a side item, although I probably could. I also leave the potatoes and onions for the day of. Sometimes my snack prep gets mixed in with the breakfast prep and produce chopping. For example, the carrots I slice also double as snacks. I’ll also make energy bites from time to time and stick them in the freezer for my pre-run snacks. Other than that, I don’t personally do much snack prep because a lot of what we snack on is already made. But this would be the time to put together little snack containers filled with things like trail mix, crackers, sliced fruit and veggies, etc. If you have kids, these could be perfectly-sized pre-portioned containers for them to just grab and eat. I’m not one of those meal preppers that cooks a bunch of chicken or ground beef to save for the rest of the week (Not yet, anyway). But this would be the time for me to do it, after everything else is done and if I have time. If you’re like this too, then maybe you could prep a big salad (with the vegetables you already chopped!) and leave it wrapped in the fridge to eat with a few dinners that week. Anything that you think would save time during dinner prep would work here! Now that I’ve shown you my personal order of meal prep, let me give you an example of a typical Sunday afternoon here. I started out by making the pancake bites. I used my favorite Carrot Pancake recipe for the batter, and stuck a chocolate chip in each one because then I know Allison will actually eat them. Since I was actually making these pancakes for dinner as well, I started another batch of batter in the blender to save for later that evening. After putting the pancake bites in the oven, I started cooking the sausage links on the stove, stopping inbetween to put in the other batch of pancake bites. Then I peeled and sliced the carrots. Originally, I was going to use these carrots for the pancakes; then I noticed I had more carrots in the fridge, so these will be used as an extra side item. The last thing I did was wash and chop the broccoli for a side item later in the week. I wanted to make some energy bites, but I ran out of time so I’ll be saving that for later. 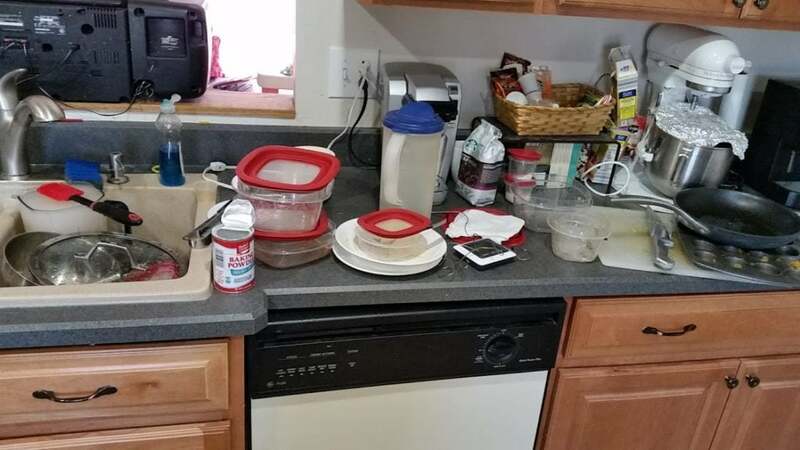 Unfortunately, that one hour of prep does not include cleanup. 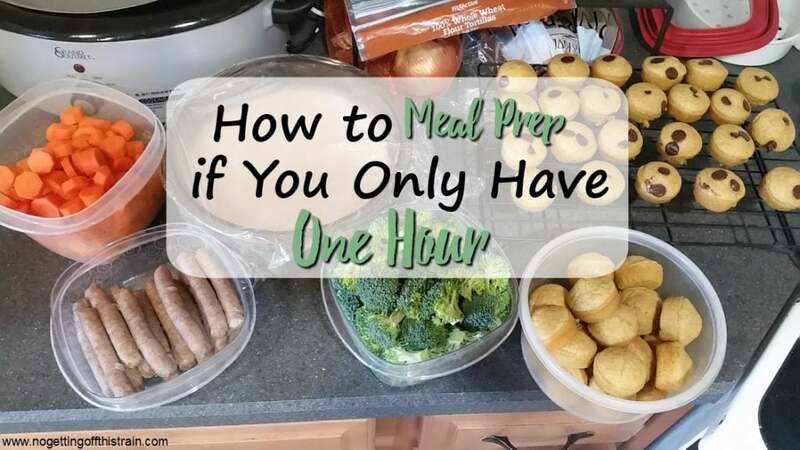 This is just one example of how to meal prep in one hour! Your one hour may look different depending on your priorities; but the point is that you do what you can to set yourself up for an easier week! 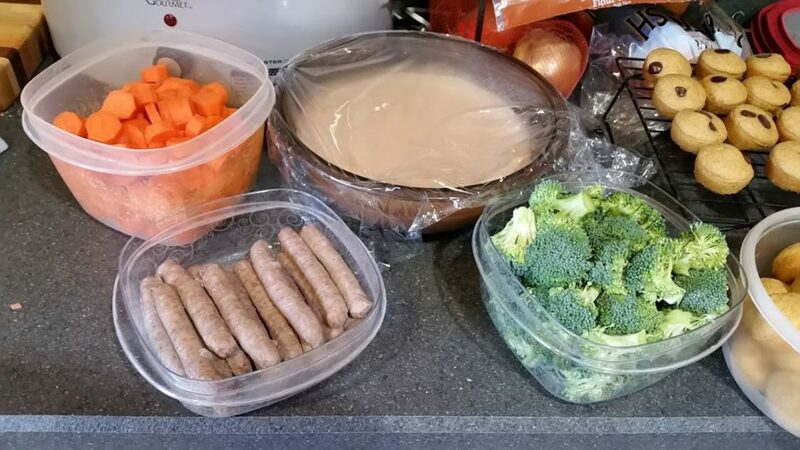 What are some of your favorite ways to meal prep when you’re short on time? Leave a comment below! Make Your Own Laundry Detergent for Only $.08 per Load!